Boston is a city that caters to those without wheels, which makes it a snap to get away. And since it’s New England, you don’t have to travel too far to find an adorable seaside town. Located about an hour outside of Boston, on the tip of Cape Ann, Rockport has attracted visitors for more than 160 years with its beaches, rocky shores, and picturesque village. Artists like Winslow Homer have found inspiration in the small town and surrounding area, and many like him have made the city their home. Visitors can enjoy a full seafood dinner in a restaurant overlooking the water, before wandering the downtown area filled with tiny shops, local cafes, and art galleries. The best way to get here, sans car, is with the Massachusetts Bay Transportation Authority (MBTA) commuter rail. One-way passes cost about $8 per person, or $16 round-trip. The ride takes a little more than an hour, and travels along the coast and through some of the state’s more well-known cities such as Salem and Gloucester. Both towns make a nice spot for breakfast or lunch. Once you arrive in Rockport, you have several options of places to stay from B&Bs to historic inns, hotels to motels. Though prices vary depending on the season, and the city is quite popular during summer months, it’s still possible to find rooms starting around $79 at a B&B such as the Seven South Street Inn. The total for a weekend trip to Rockport from Boston, including transportation and lodging, will cost about $190 for two people. A little farther north from Rockport, located on the south bank of the Merrimack River, you’ll find Newburyport, a town rich in maritime history and a prime spot for a romantic getaway. 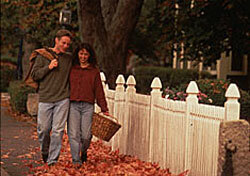 The waterfront area’s cobblestoned streets and brick buildings are the perfect place to explore with your sweetheart. Visitors will find an array of eateries, lively pubs, and local shops lining the main street. The commuter rail also travels here, and one-way passes cost about $8 per person. The trip takes a little more than an hour. Newburyport also offers a slew of places to stay, including inns, B&Bs, motels, hotels, and vacation rentals. Rooms at a B&B like the Greenleaf Inn can start at about $85 per night, but you will want to book early to ensure availability. The total for a weekend trip to Newburyport for two people including transportation and lodging will cost about $202. If you want to get out of the state, you can opt to take the Amtrak Downeaster, which travels from Boston to Portland, Maine. The trip takes more than two hours to get to Portland, but stops in several fun seaside towns like Wells and Old Orchard Beach, if you’d prefer staying in a smaller city. Tickets cost about $24 one-way from Boston to Portland, and less for closer stops. Portland provides a bit more excitement than the other options above. It combines fine dining, boutique shops, and happening nightlife with cheap seafood, local cafes, and waterfront views. A room in a B&B like the West End Inn, which is close to all the attractions, can start at about $100 per night, depending on the season. Summer and fall tend to be more expensive than the rest of the year. You can find cheaper accommodations at a chain hotel, but it might not be quite as romantic. The total cost for transportation and lodging for a weekend getaway to Portland for two starts at about $296. These are only a few of your options north of Boston and sticking to dry land. You can also investigate Provincetown, if you’re willing to get there by boat. Ferries leave from downtown Boston daily. I wish you all the luck in having a romantic and relaxing vacation away from the bright lights of the big city. As for my other readers: Do you know of a place that would be the perfect fit for kittikat? Have you traveled by train in New England, and have some insider secrets you’d like to share? Please submit any helpful suggestions below.